Learn more about the Jackson family and Ocean Lakes’ history on display in the Nature Center Discovery Lab. Ocean Lakes Family Campground was built by Mary Emily and Nelson Jackson along with their five daughters, starting in 1970. On July 2, 1971, Ocean Lakes opened with 30 campsites and one bathhouse. Nelson Jackson was 50 years old at the time. “People were lined up outside the gate by the hundreds and we were clearing spots for their campers as fast as they could park ‘em,” he explains with a smile. Today, Ocean Lakes features 859 campsites and 2,560 annual lease sites on 310 oceanfront acres with nearly one mile of beachfront, five bathhouses, and more than 360 employees in the height of the camping season. It is the largest campground on the east coast and one of the largest in the United States. On an average seasonal day Ocean Lakes has 25,000 – 35,000 guests enjoying the countless amenities that have made it a local favorite and a national vacation destination. 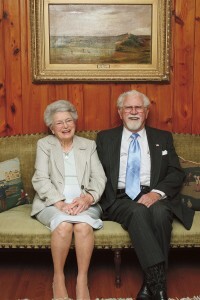 “We could do a lot of things with 310 oceanfront acres in Myrtle Beach, and we’ve had many lucrative offers, but we believe that everyone – the butcher, the baker and the candlestick maker – should have the privilege of enjoying God’s beautiful ocean,” explains Nelson Jackson, during an interview when he was 88. Sadly, we lost both of our founders in 2010. Nelson Jackson, passed away on February 1, 2010. We celebrate his life. Mary Emily Platt Jackson passed away on December 11, 2010. We celebrate her life. From the beginning the Jacksons understood that it is about the people. “We’re in the people business,” Nelson Jackson would explain to the teammates, “if they are happy they will come back.” Today, our team continues to focus on providing outstanding customer service. We appreciate guests taking time to let us know about their experience at Ocean Lakes Family Campground. There are several ways to do this! First, our team is very accessible, so if you have a concern that is impacting your vacation please let us know so we have the opportunity to address the issue while you are here. You can stop into one of our offices, or call us. Our switchboard can direct you to the proper supervisor or manager, (843) 238-5636. Secondly, you can complete our online survey at GuestRated.com. This survey was designed by Bob MacKinnon, a former Disney executive, specifically for campgrounds. Here is the link to our online survey. Our guests have honored us many times by rating us an A Rating! You can pick up one of our Ocean Lakes Magazines at our offices. In the back is a self-mailer survey about our campground. Each survey is seen by our team. The comments are compiled and posted at all teammate bulletin boards. Annually, on December 1st we pull a lucky winner from the magazine and the online GuestRated.com surveys. The winner gets one week of camping with no date exclusions! Filling out both the magazine survey and the GuestRated.com surveys only increases your chances to win. Many guests like to share their experience on TripAdvisor. Ocean Lakes received the TripAdvisor® Certificate of Excellence for consistently great guest reviews on the travel-planning website in 2013, 2015, 2016, 2017 and 2018. Finally, you can visit our social media pages and share your experience. The links are above in the top right hand corner.